ISIS will become more deadly as it loses territory. 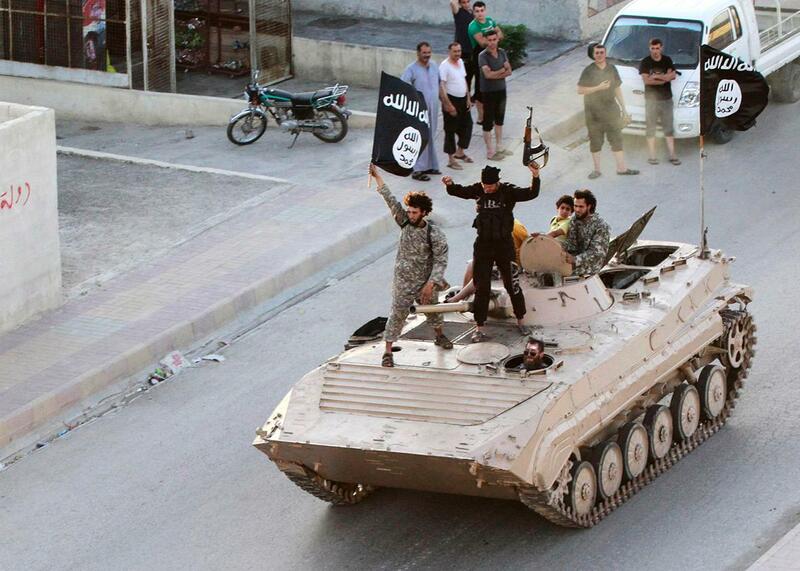 ISIS fighters take part in a military parade to celebrate their declaration of an Islamic caliphate in Raqqa, Syria, on June 30, 2014. As ISIS faces a stepped-up air and ground campaign in the aftermath of the Paris attacks, there is a good chance the group will lose more territory in Iraq and Syria. But if history is any guide, ISIS will resort to more terrorist attacks in the West as it loses ground, potentially making it a more dangerous and unpredictable enemy in the months to come. During the past year, ISIS has lost between 15 to 25 percent of its territory in Syria and Iraq from its peak levels in mid-2014, according to some U.S. estimates. That includes parts of Erbil, Kirkuk, Diyala, Ninawa, Salah ad Din, and Al Anbar provinces in Iraq. It also includes Al Hasakah, Raqqa, and Halab in Syria. Earlier this month, Kurdish and Yazidi fighters, backed by American air power and special operations forces, conducted a major offensive to retake Sinjar, Iraq. They cut off a crucial ISIS supply route between Raqqa, Syria, the group’s capital, and Mosul, the largest ISIS-controlled city in Iraq. Iraqi forces and Shiite militias, aided by U.S. airstrikes, also retook the Baiji oil refinery from ISIS. In northern Syria, the United States has deployed special operations forces to work with Kurdish militias and their Arab partners to fight ISIS. The American and Turkish militaries announced a joint plan to remove ISIS militants from a 60-mile strip along the Turkish border. The deal allowed the United States to base A-10s, F-15s, and other warplanes in southern Turkey to carry out airstrikes against ISIS positions. Russian planes have also bombed Raqqa and other Syrian cities with renewed vigor since the explosion of Russian Metrojet Flight 9268 on Oct. 31, allegedly at the hands of ISIS’s affiliate in Egypt. In the aftermath of Friday’s Paris attacks, which killed 129 people, France has now ramped up its bombing campaign in Syria. Earlier this week, French warplanes targeted Raqqa in the country’s most aggressive offensive against ISIS in Syria thus far. While France has conducted scores of airstrikes against ISIS in Iraq, it has been more cautious in Syria, perhaps wary of strengthening the hand of President Bashar al-Assad by killing his enemies. French President François Hollande also pledged that French fighter jets would intensify their assaults and said he would urge U.S. President Barack Obama and Russian President Vladimir Putin to pool their resources. “We must combine our forces to achieve a result that is already too late in coming,” Hollande said, referring to the defeat of ISIS. ISIS faces an uphill battle in the long run. It has to deal with a reinvigorated military campaign by the world’s major powers, neighboring states like Turkey and Jordan, local allies such as Kurdish militias, and the Iraqi and Syrian regimes. While ISIS has made some gains in such areas as Homs and Damascus, the trend lines are straightforward: ISIS is losing ground, and this decline will likely continue. Territorial control, of course, is the raison d’être for ISIS. Its goal remains establishing a loose Islamic caliphate that extends from Africa through the Middle East, South Asia, and parts of the Pacific. Territory is critical for ISIS to operate the “state” its leaders envision, making it more like an insurgent group than a purely terrorist organization. It needs to govern local populations, establish an extreme version of sharia in areas that it controls, and finance itself through the local economy. ISIS has its own governance structure with committees that cover the media, administrative issues, military operations, Islamic law, and other matters. It raises money from such activities as smuggling oil, selling stolen goods, kidnapping, and seizing bank accounts—all of which require territory. But watch out if ISIS’s stronghold continues to shrink in Iraq and Syria. The history of insurgent groups is sobering: Most increase terrorist activity when they lose territory. One of the most recent examples is the al Qaida-affiliated group al-Shabab in Somalia. In the spring of 2010, al-Shabab controlled more than 50 percent of Somalia, including the capital city, Mogadishu, and major ports such as Kismaayo along the Indian Ocean. By 2015, however, al-Shabab had lost virtually all of its territory thanks to internal divisions, lackluster support, effective ground operations by Kenya and Ethiopia, and aggressive U.S. military operations. As al-Shabab lost territory, it also lost fighters, weapons, local supporters, and finances. Al-Shabab’s coastal losses, for example, diminished the group’s revenue base, which benefited from port operations and taxes on goods. In cities like Baardheere and Diinsoor, which the group lost in July, al-Shabab had derived most of its funding from taxation of trade and other forms of business occurring in, or passing through, its area of control. Yet despite its loss of territory, al-Shabab significantly increased terrorist attacks across Somalia and the region. Between 2013 and 2014, the number of al-Shabab attacks tripled as it orchestrated a gruesome wave of attacks. In September 2013, al-Shabab operatives grabbed international headlines by conducting a deadly attack at the upscale Westgate Mall in Nairobi, Kenya, killing at least 59 people and wounding nearly 200 others. In April, al-Shabab perpetrated another deadly attack, this time at Garissa University in southeastern Kenya. And in October, al-Shabab called for expanded attacks against a range of targets, from the Russian government to Jews across the globe. Numerous other groups have shifted to gruesome terrorist attacks as they lost territory. The Armed Islamic Group waged an increasingly ruthless terrorist campaign in the late 1990s as it began to lose in Algeria. So did al-Qaida in Iraq in 2005 and 2006 as it ceded territory in western Iraq, even orchestrating a series of spectacular attacks in Amman, Jordan. Groups have generally ramped up terrorist attacks for several reasons. First, they sometimes attempt to coerce the withdrawal of foreign forces by punishing their civilians. In Spain, Islamic extremists conducted the March 2004 terrorist attacks in part to force the withdrawal of Spanish forces from Iraq. It likely worked. The attacks occurred three days before the Spanish general elections, which the Popular Party government appeared likely to win. But the swarm of media reports blamed the attacks on Spain’s involvement in Iraq. On March 14, voters turned out en masse and elected the Socialist Party. Asked if the attacks caused Spaniards to change their vote, 9 percent said yes. Most of those 9 percent said they switched to the Socialist Party, whose narrow margin of victory (43 percent to 38 percent) suggested that the bombing may have tipped the elections. Second, groups may resort to terrorism to bait foreign governments into overreacting. The hope is that governments and their security forces may be so appalled at the killing of their civilians that their response is excessive. Governments may unfairly target communities at home or overseas, further contributing to radicalization. In Northern Ireland, the Irish Republican Army used terrorism in the 1970s to bait British forces into overreacting, which they did during Bloody Sunday, the Falls Road Curfew, and internment operations like Demetrius. British practices sparked an upsurge in violence and a wave of support for the IRA. Third, groups that hold territory need to use some of their personnel, finances, equipment, and security forces to establish law and order. But when they lose ground, it frees up some of these resources to conduct terrorist attacks. After losing most of its territory in Somalia, al-Shabab shifted some of its focus to attacking those countries engaged in military operations in Somalia. The lesson with ISIS is straightforward. Western populations should be prepared for an upsurge in violence if ISIS continues to lose territory. There has already been a growth in attacks and plots across the West with operational or inspirational ties to ISIS. These include the attacks in Paris last week; Garland, Texas, in May; Copenhagen in February; Paris in January; Sydney in December; Ottawa, Canada, in October 2014; and Brussels in May 2014. ISIS leaders have now threatened the United States that it could be next. “I swear to God, as we struck France in its stronghold Paris, we will strike America in its stronghold, Washington,” an ISIS fighter declared in a video released this week. Chances are they mean it.